­One of the reasons that Marv Wolfman and George Perez's New Teen Titans was so popular was the clever and unpredictable writing. Take, for instance, the character Cyborg. When he first showed up, Vic seemed like the typical angry black man - he was introduced in 1980, remember, so that was still the prevailing stereotype at the time. However, within the first year that was turned on its head: yeah, he was angry, but it didn't have anything to do with being black; he was angry because of his condition, because of what his father had done to him. When that issue was resolved, his attitude brightened, proving that he'd been more than he seemed the whole time. The Four Horsemen's Cyborg is the classic version, which is probably for the best. Me, I prefer the redesign he got for the Teen Titans cartoon, but that's just a personal preference. This costume is silly, with its robotic go-go boots and the best tiara this side of Luke Cage, but the sculpt is really nice. Rather than a re-used body with painted-on details, every band, rivet, seam and coupling is a fuly sculpted piece, done admirably by the Horsemen. You've got to love that! 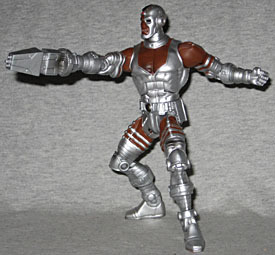 It's no secret that the DCU figures are all just a bit too big for their supposed 6" scale, but in Cyborg's case, the extra height (he's 6⅜" tall) isn't really an error - he was a tall, athletic guy before getting all messed up, so it's no stretch to claim he should be 6'4". The articulation is the standard complement of DC Universe joints, so he's got decent poseability, though the left "wrist" joint is inexplicably high up the forearm. Plus, the pads that are meant to cover his elbows are actually sculpted on the upper arms, just a bit too high. There isn't much to talk about with the paint. His body is a light silver, and his skin is dark brown. His hair (and, oddly, his robotic left eye) is black. There's a single dot of red on the center of his headband, and his belt buckle is slightly darker than the rest of him. There are also two airbrushed shadows placed just above his knees for no discernable reason, the only things marring an otherwise good design. 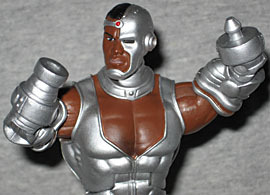 However, you really need to check Cyborg in person, to make sure there's no unintentional overlap between the silver and brown; there are a lot of small areas on the legs that get messed up very easily, and there's a very thin strip of forehead that can too easily become black or silver. The accessories your Cyborg has depends entirely on where you bought him. If you got him at normal retail stores (ie, Target, since no one else really carried Series 4), you got a clamp of some sort, and an odd... laser gun? Consulting with Poe, it's possible that these are just things that the Horsemen made up, but obviously, I don't know enough about the Teen Titans of that era. I do know that he often used a Sonic Cannon in the comics, and that particular accessory was only available with the KB Toys exclusive variant, which brings its own set of problems to the table. We'll get to that in just a minute. 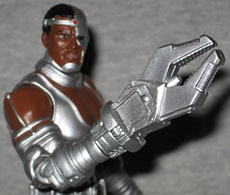 Cyborg's right hand pops off easily, and can be replaced by any of the accessories. As mentioned above, his left arm doesn't have a real wrist joint, so forget about putting two different accessories on him at once. While the left arm can be taken apart at the joint, the peg is on the wrong side, so no attaching the accessories. Anyway, the KB exclusive. It was released just as KB was going out of business, which didn't do much to give fans a shot at him (but like they've done before, Entertainment Earth stepped in to pick up the slack when KB faded). The exclusive Cyborg doesn't come with the claw or the blaster, just the cannon - in fact, he doesn't even come with a hand to replace it! So you've got a higher pricetag on a toy with less value? Not a good exclusive. As part of DC Universe Series 4, Cyborg comes with a chunk of Despero, this series' BAF. He's got the big purple right arm, embellished by a golden bracelet and prominent veins. It's very straightforward, fairly simple, but will likely offer more once it's plugged into the rest of the big guy. It's a limb. 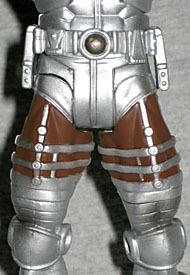 Cyborg is a nice-looking figure, with a technically proficient sculpt on his ridiculous, ridiculous costume. You have to give Perez credit, though, for putting a male hero in the kind of costume that would normally be reserved for women. Bare thighs, opera gloves and a low-cut top that shows off the cleavage? If Vic wasn't a man, it'd be a clear-cut case of the male gaze.